Every once in awhile you stumble across something that really makes you happy. A great song, a funny movie, or maybe a really freaking great cookie. Here is the brief and touching story of how I was reunited with the cookie I loved in college. Dan and I were walking through Walgreens, and there they were: Dr. Delish Organic Maple Leaf Cookies*. When I was young and impressionable and living in the Puget Sound area, these handsome fellows were known as President's Choice Maple Leaves. They were one of those accidental finds when you're newly vegan that makes you realize the world really could be a more compassionate place with very little effort and compromise from consumers. 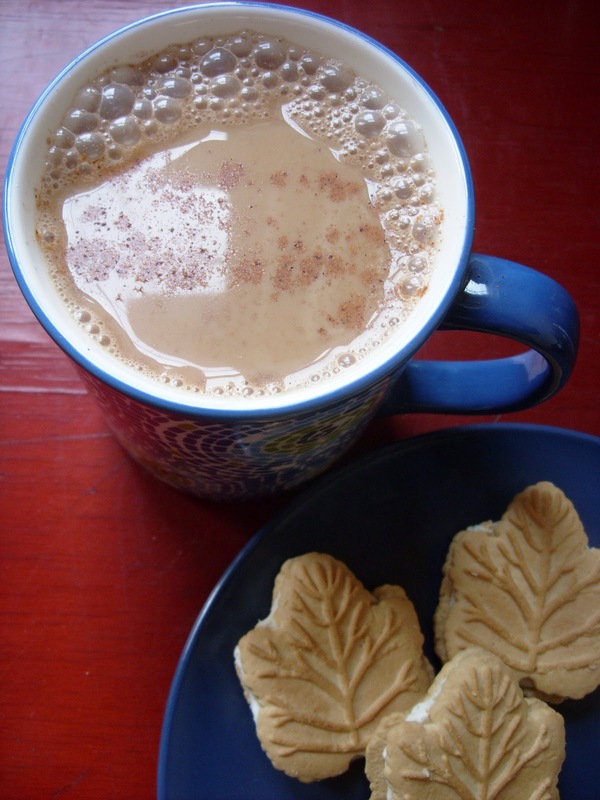 It was a deep, meaningful connection I shared with those Maple Leaves, but like most young loves, it was doomed to end when I moved to Georgia. I bring this up because when we brought these fellows home, they needed something warm and spicy to go with them. Something sweet - but not too sweet. Betty never lets me down, and had the perfect suggestion: Chai. You may not have these cookies, but you can have this Vegan Almond Milk Chai in less than 10 minutes. In a saucepan, heat the Water to a rapid boil over medium heat. Then add the Tea Bags and reduce heat to a simmer. Let simmer for 5 minutes. Then remove Tea Bags. Stir in the remaining ingredients and heat to a boil. Once it starts to boil, remove the saucepan from heat. Yum. This is happening ASAP. Is there a reason why you use the almond milk? Ps. I still live in the Puget Sound and I have never EVER heard of these Presidential cookies! Where would you get them? Well I like Almond Milk in my hot drinks that don't have a lot of chocolate or coffee in them because some soy milk can have a kinda cereal taste if it isn't steamed and foamy and I think the almond flavor compliments the tea better. I used to get my presidents choice cookies at Fred Meyeer stores but they are a Canadian company so the closer I got to the border the more places I remember seeing that brand. Hope that helps! I totally agree with you about almond milk. My main problem with soy milk in hot beverages is curdling. I've never had that problem with the Almond Breeze brand, but I noticed that the Whole Foods brand of almond milk did curdle. It was also very salty! Almond Breeze is the best; I just wish I could get my kids to drink it! I get cookies that look just like that at Trader Joe's. I think they're called Maple Leaf Cookies. My kids love them! I NEED these cookies! I've been trying all morning to figure out where I can find them! I might have to have a friend in NYC send them to me. Any ideas for buying online?